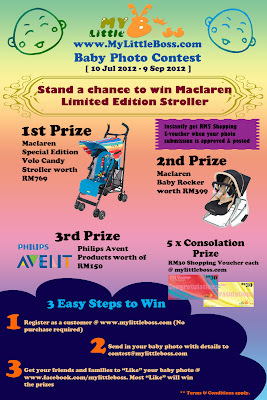 ** Plus for every participant that submitted and get posted, we will give you an e-voucher worth RM5 for your purchase at www.mylittleboss.com. Min purchase of RM80 is required. ** Kindly note that all the prize shipping charges will be borne by participants. Only minimal charges apply. Your photo will be posted by our admin to our official facebook page. Get your friends and family to "Like" your baby photo. Most "Like" will win the prizes. Visit MyLittleBoss website for more details.